On the website “Genesis Science Research” (www.Setterfield.org) an article is written by Mr Randy Speir that is apparently a challenge to my cosmology. Normally I don’t respond to frivolous claims as I think this is but it does remain out there, unchallenged, and so here is my response, with my comments interspersed between the author’s original comments. The original is in black text and mine in red. Since John Hartnett published his young universe model in 2007 in Starlight, Time and the New Physics, he has met with little challenge, at least publically. Yet, upon investigation, the construction of his model demonstrates striking weaknesses, one of which may be dire. About four difficulties are discussed below. While his math may seem robust, it is only as good as the structure it builds. Surprisingly, it is something so elementary in nature which may undermine his efforts and ultimately bring the model down. Since, in the discussion of his ideas, he was deliberately silent about the beginning, his response to this challenge should evoke a full disclosure of the mechanics of the model from the very outset of creation. On that explanation will hang the fate of his ideas. JH: It is very difficult to understand what he is talking about here. I certainly do not understand what the weaknesses are, especially the one that is “dire.” I am not deliberately silent about the beginning (of Creation, I assume he means). It is outlined in my book to which he refers. If he refers to Days 1-3, it is true there is not a lot of detail in the book, but the book really only deals with one proposition: How do we see starlight from sources billions of light-years away in a 6000 year old universe? My mechanism solves this problem by rapid expansion of the fabric of space on Day 4 of Creation week and as such the details are all focussed on that one day. Hartnett may himself be using a fudge factor to help eliminate another ‘fudge factor’. JH: Actually I agree with him. He wrote most of this as a Letter to the Editor of the Journal of Creation1 which was published in April 2013. In November 2012 he was informed I would respond and proof pages were ready by 4 February 2013. In my response to his original letter I agreed with him on this point. A new dimension of the velocity of the expansion of space may be a fudge factor. The model I presented is not my own, but was developed by Prof. Moshe Carmeli, who was the Albert Einstein Professor of Theoretical Physics at Ben Gurion University in Israel up until his death in 2007. I simply applied his model to a creation scenario. So really this complaint is against Carmeli’s cosmology. 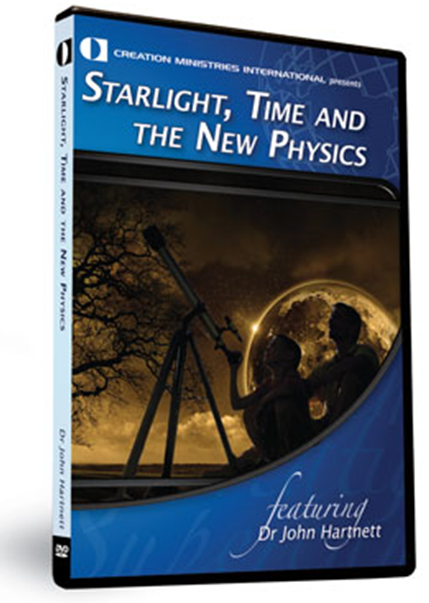 A key motivation for his work (Starlight, Time and the New Physics, pg. 122) is to obviate the need for dark matter, which to him is only another big bang fudge factor (pg. 14). JH: No, that is not the case. The motivation for the book and the work that led up to it was to describe the observations in the universe as simply as possible, and, in doing that I discovered that dark matter was not needed. I did not set out to eliminate dark matter. I do think it is an unneeded fudge factor, but it was not a key motivation. Carmeli himself had included dark matter and when I discovered it was not needed2 he was delighted. However, to attain his goal, he overreaches and upsets physical convention to add a new dimension to the spacetime metric – “spacevelocity”. JH: As I have explained above, it is not my cosmology. Carmeli added a new dimension, which I admit is hard to understand. It is outside of our experience but so is most of what is in the cosmos. And the terminology also is Carmeli’s. In truth, his 5D universe adds a second temporal term to our otherwise conventional 4D spacetime. To him, there are two time dimensions. JH: No, it is a velocity dimension, which is timelike. Its units are not of time but of velocity in the Hubble flow. But if you know even the basics of metrics and the physical orientations of their terms, it is not at all surprising that a bonus dimension might well give the appearance of solving the problem of galaxy rotation curves (a feat to which he lays claim in Appendix 3). JH: It was not obvious to me that Carmeli’s approach would solve the galaxy rotation curve problem. This is the observed speeds of gases in the outer disks of spiral galaxies are too high suggesting that there may be unobserved “dark” matter in a spherical halo around those galaxies. I applied the Carmeli model and discovered it could describe their dynamics without dark matter. The latter is a published fact. See references 3, 4, where I apply Carmeli’s cosmology to actual data. This may prompt another physicist to insist that what Hartnett has found is a mathematical explanation for the effects of halo dark matter on galaxy rotations which mimics a fifth dimension in the spacetime metric! And who could argue? After all, neither dark matter nor the spacevelocity dimension currently exist as anything more than theoretical constructs. Neither has yet been demonstrated to be a physical feature of our universe. So which is the real ‘fudge factor’? It’s all a matter of perspective and bias. Hartnett says dark matter is not real but convention says a five dimensional universe is not real. So, we should expect mainstream physicists to remain underwhelmed about his findings, especially in light of the fact that one has to swallow down a 5D universe to go along. Besides, Hartnett’s is not the only “new physics” around. MOND, a new twist on the physics at galactic scales, and one which by the way upholds 4D convention, has recently enjoyed success in explaining galaxy rotation curves (see “More Evidence Against Dark Matter?” 25 Feb 2011 in Science Now). Of course, Hartnett will argue that MOND is an empirical approach while his is theoretical, and so is preferred (pg. 47). But again, at what cost? To surrender longstanding convention to aid in his effort to rid the universe of the need for dark matter is not viewed as an even trade in a cosmic economy. Hartnett’s big claims may flounder until he is somehow able to show that the spacevelocity dimension must really be there. A series of falsification tests are needed. Until then, physicists and cosmologists are only right to shelve the idea and regard it as not much more than a curiosity. JH: One cannot even prove that space is expanding let alone that the universal expansion is accelerating. These conclusions result from the application of a mathematical model to the observational data. There are many models that can describe the same data. There are many solutions to Einstein’s field equations from which the models are derived. There is no way any one can do an empirical test on a model. And convention is not relevant at all. Cosmologists and particle physicists have gone way beyond 4 dimensions for the universe. In one form of string theory they have as many as 28. Many reputable physicists have employed extra dimensions, including Prof. Itzhak Bars.6 The latter uses 4 space and 2 time dimensions and regularly publishes in the American Physical Society journals. Harnett [sic] shows ambivalence in his treatment of the cosmic microwave background, the CMB. Hubble law may not in fact be operative in Hartnett’s universe model. JH: This is ludicrous because the metric upon which the model is built implicitly assumes the Hubble law as an axiom. JH: This is a restatement of my prior comment and is the special nature of Carmeli’s cosmology. Unfortunately, since Hartnett’s model requires an instantaneous and miraculous creation of space and some matter [possibly just the earth?] in spherical geometry out to a radius as far as 8 million light-years through the third 24 hour period of creation time (pg. 103), there is the possibility that the metric may be limited to constraints on dt and ds, such that dt ≥ 3 days and ds ≥ 8 million light-years. JH: This make no sense at all. The Earth is miraculously created by God on Day 1. According to the model, and my starting assumption, when God expands the fabric of space with an enormous acceleration, new matter is created over the space of the Day 4 period, which lasts for billions of years as measured by cosmic clocks. I suggested on page 103 that the initial radius of the universe could have been 8 million light-years. His limits on the differentials above make no sense at all. The expansion of space occurs throughout the whole universe but outside the solar system, which undergoes no expansion. Even within the initial region of space where God made the first stars and galaxies space expands and this provides enormous time dilation with respect to Earth clocks, because the region close to and around the Earth does not undergo any expansion. See reference 11 which is reproduced in my book in Appendix 6. It is only on day 4, after the miraculous 8 million light-year interval has been in place for three days, that the spacevelocity term in the metric is turned on, so to speak, and the cosmic expansion ensues. JH: He states “the miraculous 8 million light-year interval has been in place” which you will not find written by me anywhere. A light-year is a distance not a time interval. If he meant a distance interval then the sentence makes no sense. a situation which would seriously call into question any Hubble spacing of galaxies in the expansion. Worse, it may overthrow the entire model. For instance, how fast does light traverse the divinely created 8 million light-year radius? If the answer is, “Instantaneously,” then its measure is not truly 8 million light-years (since light speed is the measuring stick), but profoundly more diminutive, like the size of the super-dense, super-hot cosmic egg of the big bang, and Hartnett is left with space, matter, energy, and time expanding in a big bang-like model. JH: Of course it is an expanding universe model. It has the Hubble law as a fundamental axiom. Added to that is a super-rapid acceleration of the expansion during the Day 4 period of Creation. This is rapid acceleration which is explained in Appendix 6. God switches that acceleration on at the beginning of Day 4 and then off at the end of Day 4. If the answer is, “Light traverses the 8 million light-year radius in the usual 8 million years,” then we will not see distant starlight in a young universe because the conclusion of Hartnett’s incredible Day-4 expansion event can essentially bring us no more light along our line of sight than what we witnessed at its start! As the Day-4 expansion “supersizes” the universe from 8 million light-years to 13.54 billion light-years, our total four day view into space will grow in step from 0.011 light-years to 18.62 light-years. Since the model declares that all clocks everywhere will begin to tick at the same rate after the universe recovers from its 24 hour cosmic jerk, we will still only see 6019 light years into space after 6000 years of earth time have elapsed. Distant starlight will not be ours to witness. JH: This makes no sense at all. Considering I have supplied all the physics in my book, I can only conclude that Mr Speir does not understand differential calculus. And as I have calculated and shown in Fig A6.2 the expansion ensures that light from anywhere easily reaches Earth in a very short period of time and that stream of light will continue arriving here for billions of years. Part of the mechanism is that one can calculate an apparent one-way speed of light which becomes enormous by the same magnitudes mentioned here. But it is not a change in the local speed of light (c), which determines all normal particle and gravitational physics. Apparently, John Hartnett’s unstated, non-negotiable requirement for his universe to bring distant starlight to a young earth is that the surface of the earth must maintain full communication with the edge of the initial 8 million light-year space interval from the beginning. JH: No, this is not a specific claim I have made—stated or unstated. But of course the Earth remains in causal contact out to 8 million light-years. I claim the Earth must remain in causal contact with the most distant sources in the universe, out to ten billion light-years or more, for us to be able to see them now. For this reason the clock rates must increase enormously during Creation Day 4. Appendix 6 clearly explains the physics how this could have happened. Two choices come to mind. God can either postpone “the beginning” for 8 million years while Earth waits for full communication to happen, or it can communicate instantly and find itself caught up in a hot big bang scenario. Either choice voids the model and its claims. If, in response, Hartnett appeals to a divine suspension of physical laws allowing for an instantaneous superluminal meeting of the earth’s surface and the universe edge 8 million light-years away, then he has adopted an inflationary cosmology, an action which to many will be just an ad hoc rescue of the model – a fudge factor. JH: He fundamentally does not understand the model. There is nothing special about the 8 million light-year initial radius for the creation of matter. When the universe expands the whole universe expands, including the initial region that contained the galaxies created before the expansion began. Only the region containing our solar system does not expand. His whole claim here is wrong. The acceleration of the expansion acted like a step function to give cosmic clocks 10 trillion times more time in the cosmos than Earth clocks. Now imagine a source sending a light signal towards Earth just before the expansion started. That signal would have 10 trillion times more time available to it to get to Earth than it would have if there was no acceleration of the expansion. At a distance of 8 million light-years it would take 8 million years to get to Earth in a static universe, but it would take only about 30 minutes in the universe my model describes. Both time periods are measured by Earth clocks. I will not comment on Mr Speir’s more personal exchanges with the Editor of the Journal of Creation except to say that I think it is very inappropriate for him to publish those comments (in isolation) on the Genesis Science Research website. J.G. Hartnett, “Spiral galaxy rotation curves determined from Carmelian General Relativity,” International Journal of Theoretical Physics 45(11): 2147-2165, 2006. J.G. Hartnett, “Spheroidal and elliptical galaxy radial velocity dispersion determined from Cosmological General Relativity,” International Journal of Theoretical Physics 47(5): 1252-1260, 2008. This is great John. Good to see you trying to set the record straight. 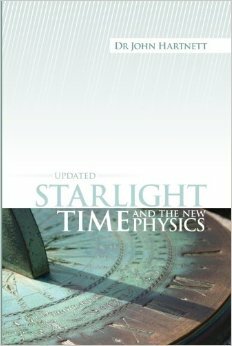 I suggested to Stephen Lawhead (Christian sci-fi author) that he should read Starlight Time and the New Physics since he took exception to Christians who threw out “the scientific evidence” of a long age Earth. Did you present the model? Did you apply it to a creation scenario? Did you present it in a book as part of a solution to a creation problem? So is the complaint not directed at your use of it in your model? Are you claiming you have no model? If I added your work to my model and then stated “Your issue is with Dr. Hartnett” would you except that response? Randy Speirs is criticizing Carmeli’s use of a new dimension–a velocity dimension. The cosmology I used is Cosmological General Relativity developed by Carmeli, so what I am saying is true. He is criticising Carmeli. I used his model. It would be like me using Einstein’s cosmology and applying creationist boundary conditions and calling it mine. It would still be Einstein’s. I did in fact find a different solution to Carmeli’s, and that model I would call the Carmeli-Hartnett model. See THE UNIVERSE: FINITE OR INFINITE, BOUNDED OR UNBOUNDED. Speirs’ complaint is not directed at my use of Carmeli’s model, but actually the basic physics of the model itself, which he does not understand anyway. Something else I found quite perplexing was your response shown below. I find Tesla sums it up best. This is why I’m looking at physics in a purely mechanical way. I avoid as much math as possible in my search for the TRUTH. I do believe that while we may not be able to create a universe in the lab the mechanical explanation of how the universe came about can be seen everywhere and explained. Did you use terms without understanding them? Would you ever except from someone else an explanation on a topic in which they plainly state they don’t understand? Please understand I’m not trying to argue the case against your model or in favor of the arguments presented in the post I’m merely trying to gain a deeper understanding of you and your model. My comment about cosmology being just mathematics is that it is very weak compared to experimental physics done in a lab. Cosmology is different to repeatable experimental science. Hence one should not get too hung up on a so-called prediction being observed because one would have to rule out all other possible causes of that observation before one could say it was a real successful prediction. Hence in that sense cosmology is not science. Don’t misunderstand, I truly believe in the power of a good robust testable theory, like Newton’s law of gravitation or Einstein’s special and general theories of relativity. These theories properly applied, without fudge factors, have been tested and proved very successful on Earth and in the solar system. Carmeli suggested on the very large scale new physics was needed, and that is where his velocity dimension came in, and Cosmological Relativity was born.